EMAIL us at support@dyersonline.com to request samples of the different fabric colors. -- Please Select --1" 2" 3" 4" 5" 6" 7" 8" 9" 10" 11" 12" 13" 14" 15" 16" 17" 18" 19" 20" 21" 22" 23" 24" 25" 26" 27" 28" 29" 30" 31" 32" 33" 34" 35" 36" 37" 38" 39" 40" 41" 42" 43" 44" 45" 46" 47" 48"
Custom RV Windshield Drapes are drapes for your RV front driver's and passenger's windshield. They are pleated and are usually made in pairs (2 panels), but can be ordered as a single panel, three panel, or even four panel (call our 800 number for help with 4 panels). All custom RV windshield drapes come with one set of tie backs (18" x 6") that secure with Velcro, so they can be easily kept out of the way when not in use. NOTE: IF YOU ORDER 1 PANEL, YOU WILL ONLY RECEIVE 1 TIEBACK. 2 PANELS RECEIVE 2 TIEBACKS. 3 PANELS RECEIVE 3 TIEBACKS. IF YOU NEED AN ADDITIONAL TIEBACK, PLEASE SELECT IT ON THE DROP DOWN MENU! Turin is a faux silk design that is woven of 100% polyester, and is intrinsically fire retardant™. The supple, rich sheen projects an eye catching affordable elegance. Terra based neutrals and a novel bank of colors, highlight this innovative faux silk. It also passes MVSS-302 fire retardant test. For over fifty years, Gary Manufacturing has been a leading provider of textile products so you can be sure your custom RV windshield drapes will hang nicely and fully cover your windshield. Select from 1 of 6 beautiful colors for your new custom made windshield drapes. Curtains are vacuum regularly and dry clean only. All of our curtains are ready to hang on your existing track when they arrive. 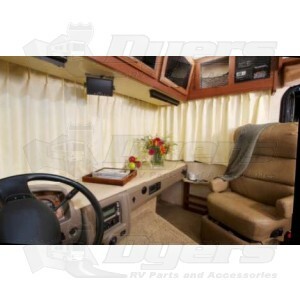 The curtains are fully lined, and custom made for your RV. All pricing is based on size, style, and options selected. Ordering custom curtains is as easy as 1,2,3! STEP 2: Select your size. - Click on image number two to see step two. 1) Measure the driver's side track from side to side for your left hand curtain. This is your driver's side width. 2) Measure the passenger's side track width from side to side for your right hand cutain. This is your passenger's side width. 2a) If you need a center panel, measure the center track from side to side for your center curtain. This is your center panel width. 3) Add all widths together to get your total track width. PLEASE NOTE: Total width can not exceed 230" (Please contact us for help). - NOTE: Note we're asking for track widths, not finished widths of your current curtains. We know how much fabric needs to be added to make your custom RV windshield curtains nice and full! 4) For curtain length, measure from the top of your curtain track down to where you want the curtains to hit. Or, if you have existing RV curtains, measure their length from top to bottom. STEP 3: Choose your carrier. - Click on image number three to see step three. If this is the first time you're ordering new RV windshield curtains, you may be wondering how you will hang them. Don't worry, our custom RV windshield curtains come ready to hang on your existing curtain track. All you need to do is pick the corresponding number from the choices in image number number three that looks like the carrier you're currently using and select that carrier number when you place your order. NOTE: If you select 5,6,7, or 8 we will substitute 2,3, or 1 and make your drapes with steel pin hooks. - The #4 snap carrier is 3/4” in size, and fits on 5/8” track, and the carrier can be removed from the tape. This carrier is more common on RVs made before 1990. - The #9 glide measures 1/2” in size and fits on 3/8” track. The carrier is permanently riveted to the tape and cannot be removed. This carrier is more common on RVs made in 1990 and newer. - Due to the extreme custom nature/personalized manufacturing of this item, these can NOT be canceled, exchanged or returned. - Once you hit the place order button, you own them. NO EXCEPTIONS! - Please carefully check, then re-check your measurements and shipping information before you complete your order. - Once your order is submitted it can NOT be changed or canceled. Custom application, you design to fit your specific needs. Ready to hang on your existing track. Reinforced heading keeps pleats neat. Separate lining material provides superior privacy, light control and insulation. Pleats folded and ready to hang on your existing track. Added fullness for richer appearance. Matching tie-backs and new drape carriers included. Tieback(s) and new carries to hang your curtains with. Available in 1, 2 or 3 panel configurations ranging from 0 - 230" Wide and 0 - 48" Long. We needed to replace our front window curtains which I ruined (old and dirty, still don't wash them). As I was going through the process of trying to find new curtains I found it to be irritating and hopeless. Then I stumbled upon Dyer RV and the Gary Manufacturing RV Drapes. I was concerned about ordering via the web so I called Dyer RV for help. The associate I talked with was very helpful in telling us exactly how and what we needed to measure in the RV. As we went back and measured and called with the results. The associate during our 2nd call was as helpful as the 1st in the process and took all our information even the brand and series of class A we owned. She said this can be helpful because sometimes the Gary has the measurements on file already. Three weeks later we received the drapes and they were PERFECT!! Thank you Dyers RV for your help AND for being so friendly and helpful! We will purchase again from you! Nice new look. Very bright inside now. The young lady that took my order was class act. Delivery time was just what I was told. I haven't installed them yet is the only reason for 4 stars and not 5. The material and carriers looks good. Can't wait to install them. Could not be more pleased....The fit was perfect the quality of the fabric, lining and workmanship were all excellent. The only negative is that it is impossible to determine the color by looking at a device screen (which is true with anything purchased online). My recommendation is to order a swatch so you know you are ordering the color you want. We are very pleased with our drapes. Ordered color lentil. They are lightweight and shut out light very well. The look is 100% improvement over the other drapes we had. The price and service was very good. Dyers rv was a great help when ordering. Thank you very much. These are great people and price is right.